Charge and use your iPhone X / 8 / 7 / 6S / 6 in your vehicle with this slim case compatible Brodit active holder with tilt swivel. I have only once not bought Brodit and regretted it. As usual the Brodit kit is top quality and well worth the money. I wont make the mistake again and waver from this brand. You answered all my questions via email before I purchased the holder. Designed to hold your smartphone on your dashboard, the Brodit Active Holder lets you use your phone safely for taking calls via Bluetooth, connecting to your speaker system or as an in-car navigation system. The Brodit Active Holder lets you keep your attention focused on the road and both hands firmly on the steering wheel, while the holder itself allows easy access to the charging port and headphone jack port. 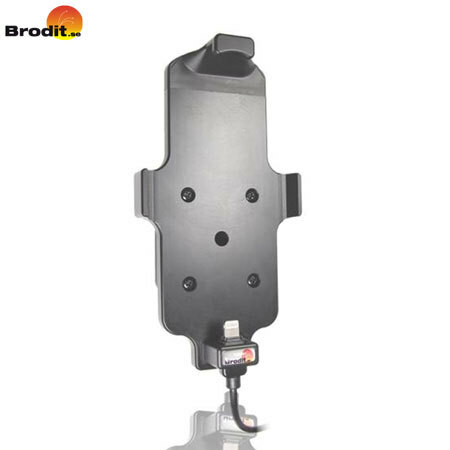 Attached to a ball joint swivel bracket, the Brodit Active Holder allows you to adjust the position of the phone holder 22° in each direction in order to reduce light reflection and improve the visibility of your phone in different driving conditions and positions. With a slim case attached to your iPhone 7 / 6S / 6, you can still dock your device within the Brodit Active Holder to save you removing the case from your phone. Brodit Active Holders are a great choice for mobile phone users who frequently use their phone in the car, by including an integrated iPhone 7 / 6S / 6 car charging cable to make sure your phone is kept fully charged on long journeys and commutes. The inside of the holder includes light padding to ensure that your iPhone 7 / 6S / 6 doesn't get scratched or marked when being used in the holder. The Brodit Active holder is designed to be fixed to your dashboard, either using a Brodit ProClip, or by screwing into the dashboard directly. This holder can also be attached to a Universal Suction Mount. For installation instructions please visit the official manufacturer website here.